It may sound like a noble idea and a legacy to be left behind but organising the 29th Sea Games and the 9th Asean Para Games jointly next year can only mean chaos. Already, last year’s Sea Games host, Singapore, is a tough act to follow; it is said to have organised the best Games ever. So, doing two Games together would be putting too much on our plate and inviting unnecessary pressure. The newly elected board of the Paralympic Council of Malaysia (PCM), headed by president S.M. Nasarudin, has proposed to the Olympic Council of Malaysia, and gained the support of Sports Minister Khairy Jamaluddin, to hold a joint Games and call it the inaugural Asean Games or “1 Asean Games”. Bringing a joint Games to fruition would be no mean feat. Yes, if successful, it will be a legacy for the prime movers as they would be the first to do it. But it is going to be a nightmare in terms of logistics and resources. It is learnt that the prime minister has been convinced that organising both the Games will reduce organisational costs, especially since there will be only one opening ceremony and one closing ceremony for both the Games. He has given the idea the nod. Traditionally, the Para Games is held after the Sea Games. And it is the same for the Asian and Olympics Games. But it is the Commonwealth Games that PCM is trying to emulate where both the Games are held jointly. However, for the Commonwealth Games, there are only 10 core sports on the programme and an additional seven from a list of optional sports/disciplines while for the Para Games, there are four core sports that must be included, and then an additional three listed as optional Para-Sports. But the events must not exceed 20, which must be fully integrated into the overall sports programme. Thus, the overall number of sports is small at the Commonwealth Games and minimal at the Para Games, and thus manageable. While PCM have claimed they have the full support of the Asean Paralympic Council for a joint Games, it is learnt that it was not a unanimous decision and several officials on the PCM board do not see the idea as feasible. For starters, the Philippines, the next host of the Sea Games in 2019, have come out openly to say that they do not have the means to organise a joint Games and will host the Games separately. So, does this mean the joint Games will just be for the Kuala Lumpur Games? But before that can happen, the Sea Games Federation (SGF), who are meeting next month in Kuala Lumpur, have to endorse PCM’s proposal, which has to be supported by OCM. For starters, OCM are still waiting for a detailed proposal on how the joint Games can be organised with all the logistics and resource details to be studied before presenting at the SGF meeting. OCM have been given preliminary brief by PCM saying that except for athletics and swimming, all other events can he held at the same venue for both Games. * Whether the duration of the Games will have to be extended because of the number of events. For instance, for athletics and swimming, Sea Games will see 46 and 38 respectively while for the Para Games, it will be a total of 95 events for athletics (because of the items for a single event under various categories, that is for the 100m there will be 21 events!) and 91 for swimming. A total of 16 sports have been proposed for the Para Games with a total of 240 events for men and 120 for women for a total of 1,215 medals as opposed to the Sea Games’ current selected 34 sports – comprising 342 events – but this could well increase to 40 or more sports when the SGF meet next month to decide on the final number of Games after appeals made after the last meeting in February. Currently, the Sea Games is scheduled to be held from Aug 19 to 31 with the closing ceremony coinciding with Malaysia’s 60th Merdeka celebrations. · Logistics issues of transport, accommodation, venues and distances. · Resources – whether we have enough officials for both Games as many officials officiate in both Games. · Expenses – whether it will actually be cheaper or could be the same to organise two Games separately. · Media – with all the media attention on the Sea Gams, will the Para Games get enough publicity? Will the media have enough resources to cover both Games held simultaneously? · Spectators – whether we will have spectators at the Para Games as the majority would prefer to watch events at the Sea Games. This is the sixth time the Sea Games will be held in Malaysia (after 1965, 1971, 1977, 1989 and 2001), which sees the biennial Games being hosted after 16 years. Naturally, Malaysia want to make it a memorable affair. It will definitely be a challenge to handle about 7,000 Sea Games athletes and officials and even more challenging to handle and cater for 3,000 para athletes. We seriously have to ask ourselves whether it is manageable or are we courting trouble? We have to decide, once and for all, whether we want to have a great Sea Games separately or a joint affair and head for a fiasco. The decision to let our young athletes compete in the IAAF World U20 championships in Bydgoszcz, Poland, from July 19 to 24, before they return to compete in the Malaysia Games (Sukma) in Kuching from July 26 to 29, is highly commendable. Earlier suggestions to not participate in the world junior championship because of Sukma were put to rest after National Sports Council (NSC) director-general Datuk Ahmad Shapawi Ismail met the athletes and coaches concerned, including MAU coaching chairman Zainal Abas and sprinters coach Mohd Poad Md Kassim, officials of the state sports councils and others, to get their views on the matter. A final meeting on Tuesday afternoon between NSC and the Malaysian Athletics Federation (MAF) sealed the decision that the athletes should compete in both the world junior championship and Sukma. 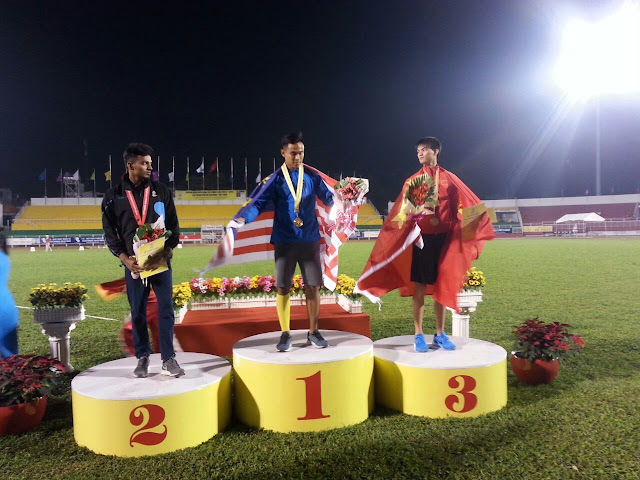 Among the athletes who have qualified on merit for the world championship are the winners of the Asian Junior championship in Ho Chi Minh earlier this month, namely Khairul Hafiz Jantan (100m), R. Kirthana (triple jump) and Mohd Rizzua Haizad (triple jump). Meanwhile, sprinter Badrul Hisyam Abdul Manap booked his ticket after clocking 10.53s at the 2015 UniMAP Open Athletics Championships, surpassing the 10.55s qualifying mark set by IAAF. Khairul, 17, after clocking a personal best of 10.30s in the earlier rounds in Vietnam, won the final in 10.36s, upsetting Japan's Ippei Takeda (10.41s) and Saudi Arabia's Abdullah Abkar Mohammed (10.45s). The latter had arrived in Vietnam as the year's quickest U20 sprinter in the world, having clocked 10.04s. Malaysia's Badrul Hisyam, whose best record is 10.34s, came in fifth with 10.54s. Khairul’s achievement gave the country its first Asian Junior gold medal in the men's category in the 30-year history of the U20 event. The contingent’s three golds, three silvers and a bronze, to finish fourth among 18 countries, have given Malaysian athletics much hope for a brighter future. Khairul also bagged a silver in the 200m with 21.15s and was a member of the 4x100m quartet, who took silver with 39.91s. 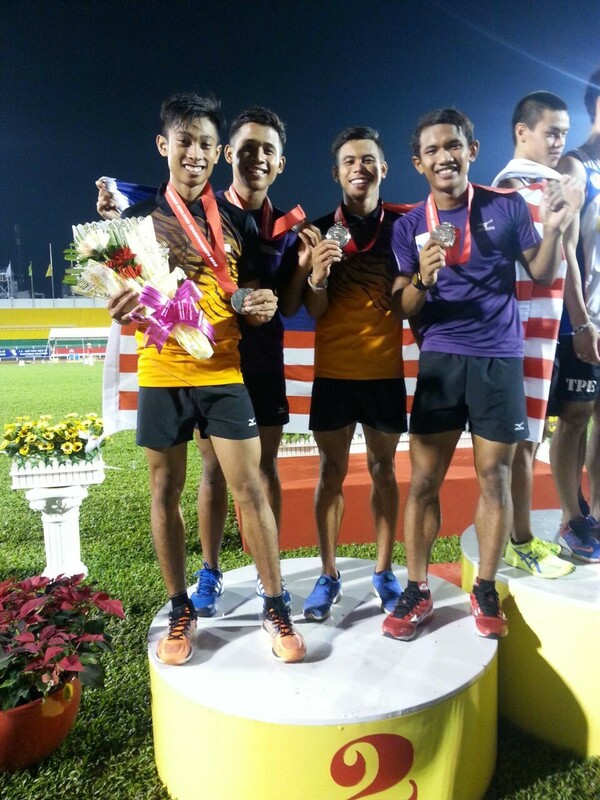 The other members of the relay team were Badrul Hisyam, Asnawi Hashim and Muhd Haiqal Hanafi. That we even thought of skipping the world junior championship for a national junior event is unforgivable and only underlines the short-sightedness of some athletes and officials. Though common sense prevailed in the end, the issue should not have come up in the first place, especially since the governing body and stakeholders like the Ministry of Youth and Sports have clear policies on such things. The complications arose because the states put their interests before the nation's. Badrul and Khairul, who are from the Tunku Mahkota Ismail Sports School, represent Malacca while Kirtana and Rizau of the Bukit Jalil Sports School, represent Perak and Sarawak respectively. These athletes probably found themselves in a dilemma because apart from their sense of loyalty to their home-state, it is learnt that they have been paid a Sukma monthly allowance for almost a year now. The lure of cash incentives for winning gold medals at Sukma and other perks must have blinded these young athletes as well. 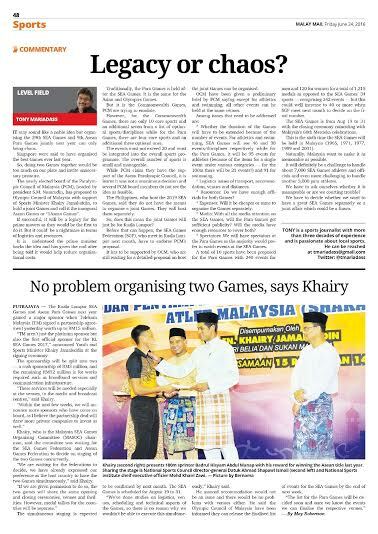 The fact that Khairul told the media that he was skipping the world youth championship because of Sukma, points to poor management of the athlete and sounds like someone put him up to it. 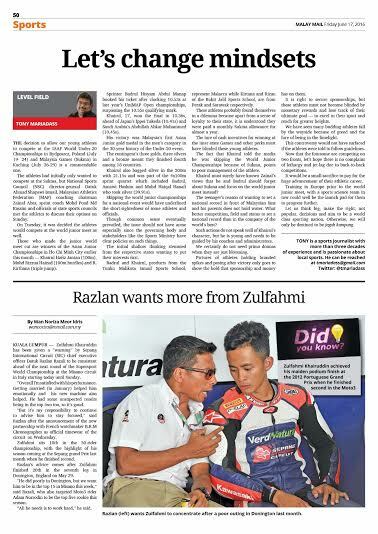 Khairul must surely have known Zainal's views that both he and Badrul forget about Sukma and focus on the world junior championship? And his reason that he wanted to set a new national record in front of Malaysian fans and his parents does not hold water. What better competition, field and status to set a new national record than a world championship? Such actions do not speak well of Khairul’s character but then he is young and needs to be guided by his coaches and administrators. We certainly do not need prima donnas when they are just blooming. Pictures of the athletes holding branded spikes to their face when posing for the media after victory only goes to show the hold that sponsorship and money already has on them. It is all right to secure sponsorships but these athletes must not become blinded by monetary rewards and lose track of their ultimate goal -- to excel in their sport and reach the highest level of competition possible. We have seen many budding athletes fall by the wayside because of greed, wanting to be in the spotlight and poor guidance. This current controversy would not have arisen if everything had been laid down clearly from the start and the athletes had been told to follow the guidelines strictly. We have a good crop of young athletes, which augurs well for the future of athletics. But petty issues and unnecessary publicity threaten to muddy the waters. Hopefully, none of the said athletes complain that they are tired and suffering from jet-lag at the thought of having to compete in back-to-back competitions. It would be a small sacrifice but a huge leap forward in their athletic career. Besides, they will probably benefit from having trained in Europe prior to the world junior meet, and with a sports science team with them, it could well be the launchpad for them to reach for the stars. Let us think big, make the right, not popular, decisions and aim to be a world class sporting nation. Otherwise, we are destined to be just jaguh kampung.